Once upon a time, in a dense forest there lived a lazy and foolish jackal. One day, the king of that forest, a strong lion was searching for some food and saw this jackal on the way. Just when the lion was about to jump and kill him, the poor jackal cried for mercy. He plead for life and said, "Dear king, please don't kill me. If you let me go now, I promise to work as a loyal servant to you for ever". The lion replied, "Servant!!! what work can you do for me?" The jackal said, "Sir, I can watch out for fleshy animals in this forest and then inform you about them. So that you can hunt and eat it." The lion also thought this was a good idea. So he let the jackal go then. The jackal used to inform about animals to the lion and the lion used to hunt and eat it. The jackal ate the remaining left by the lion. As the days went, the jackal grew more and more fat. His foolish mind started thinking in wrong ways. He thought that it was only because of him, the lion was able to hunt so many animals. So one day, he went to the lion and said about his concern. The lion laughed at this and wanted to teach a lesson to that foolish jackal. So the lion said, "OK friend, from tomorrow onward, I will inform about animals to you. You can kill and eat it. I will eat the remaining flesh left after you eat." The jackal was very happy to hear this. 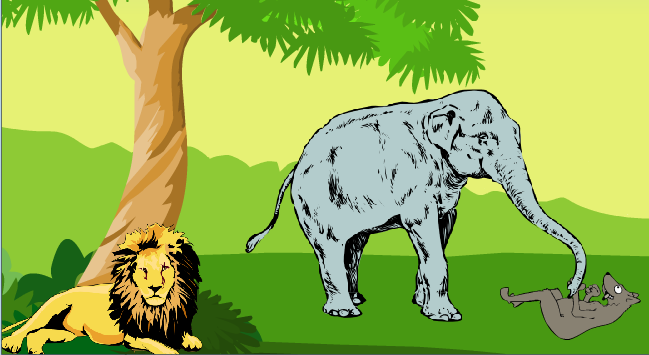 Next day, the lion saw a gigantic elephant coming. He went and told the jackal about the animal and hid himself behind a bush. Not knowing about the strengths of an elephant, the foolish jackal jumped in front of him and threatened to kill the elephant. The elephant became angry and kicked the jackal. The jackal went and fell at some distance and was severely injured. The jackal realized about his foolishness and apologized to the Lion. MORAL : Know about your weakness. thank you for your visit and the comment. Please do keep posting your feedback and suggestions.